This is a timely post with Honey in it, as it is both June today and a time where everyone is talking about the demise of the world’s bees. Without bees we are in trouble, yet no one knows exactly why all of the bees are dying. It could be chemicals or parasites or the fact that there is not enough flowering trees left to feed them. It’s very frightening. With that in mind I am starting to use up some of the honey that is past it’s best before dates at work. I don’t want to waste any of the precious sweet nectar they have produced. A world with out honey is sad but a world where bees can’t pollinate all of our crops is another far more realistic horror. 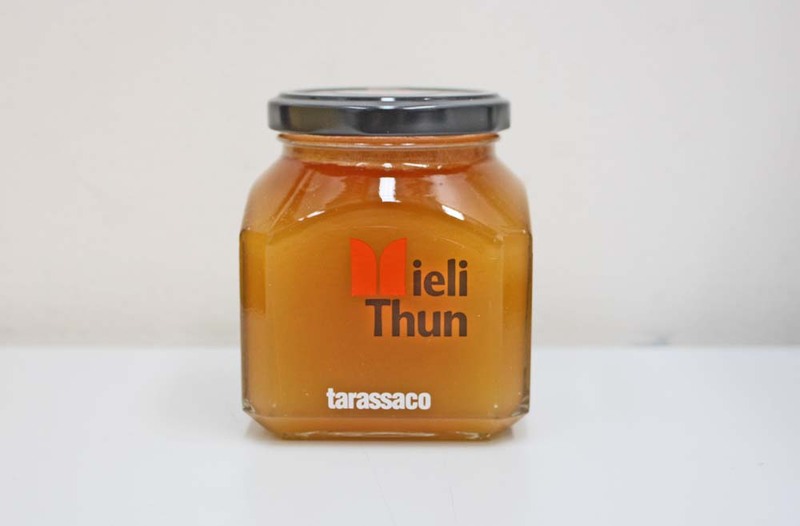 This is Dandelion honey. It is wild collected by a nomadic bee keeper from northern Italy. I make a few kinds of honey cake. 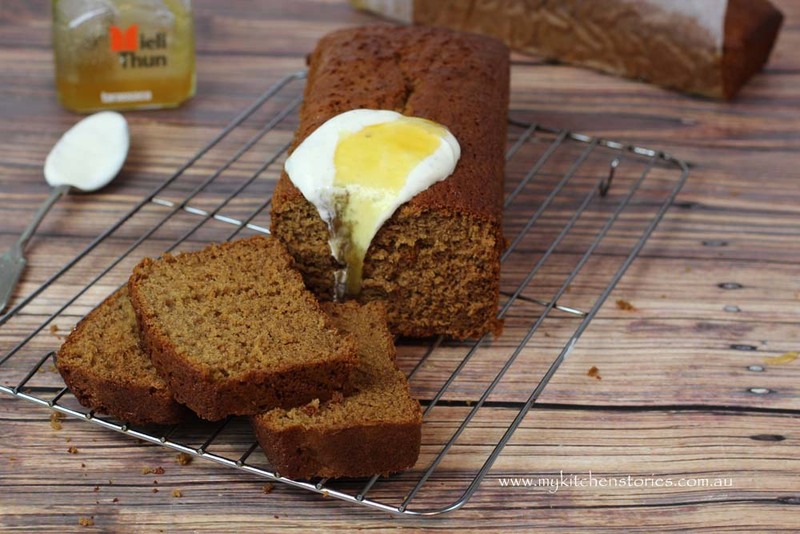 This honey cake is very light and fluffy and not sweet at all. It isn’t a ginger bread style heavy cake. 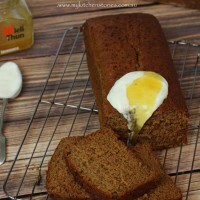 It would be lovely with honey icing or honey cream or sweetened vanilla yoghurt. It can be made on a flat tray too and rolled up with some cinnamon cream, just like a Swiss roll. Lately I’ve been making this snack to fill the gaps and take to pre-dinner drinks. 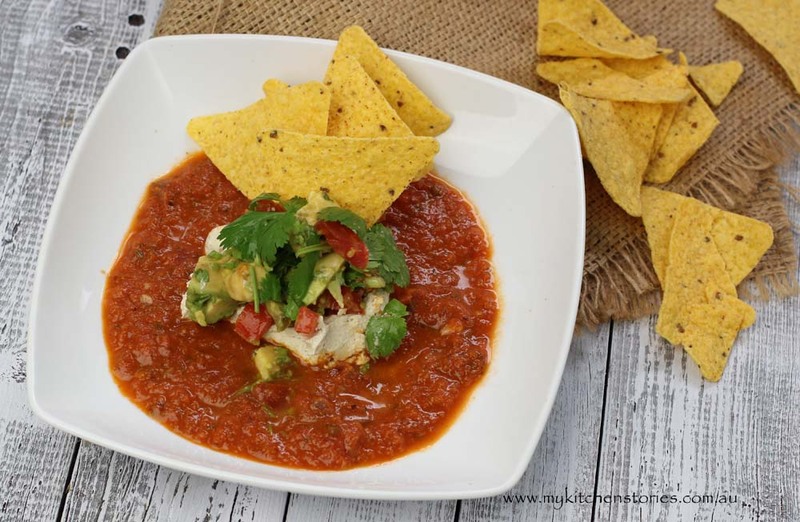 It has a lovely chipotle chilli tomato sauce, spicy but fresh then a cashew crema with lemon. This is a delicious lower fat way to eat a nice creamy element with your chips. Just soaked and puréed natural cashews with lemon and a bit of cumin, then I add and a punchy tomato, chilli avocado salsa. Take a bit of each thing and it is heavenly. Looks good don’t you think? Skater has become very fond of Burek. We are in an area of Sydney that is an amazing food melting pot. Rockdale is an interesting place to take a shopping trip of the food kind, with Asian butchers, rubbing shoulders with Turkish coffee shops, old fashioned deli’s and Thai, Chinese and Vietnamese restaurants. Down the road you will find Ibrahim Middle Eastern Bakery selling Baklava, near the station is a host of new coffee stops along side a Balkan Barbecue. You will find Indian and Middle Eastern spice shops and a cracking good charcoal chicken shop along with a growing Bangladeshi community, offering spices, clothing and restaurant food. On the far side of the train line are Lebanese Pizza shops, halal butchers , cafes and spice shops. Skater though, only has eyes for these Borek. They are a Macedonian specialty, although a version of them can be found in Turkey, Greece, Croatia, Armenia, Bosnia and Serbia. Burek ( also Borek and other variants) is a family of baked filled pastries made of a thin flaky dough like phyllo (or yufka) . They come hot from the oven in big rounds and cut to order with a sharp rounded knife that kind of hacks them into quarters. Each quarter is $5. There is a meat version, a cheese ( ricotta/feta)one and a spinach and cheese combo. On a Saturday you must wait patiently in a long line as each person shuffles through collecting their hot crispy treat of greasy heaven. I like the Balkan Oven on King Street in the walking mall. 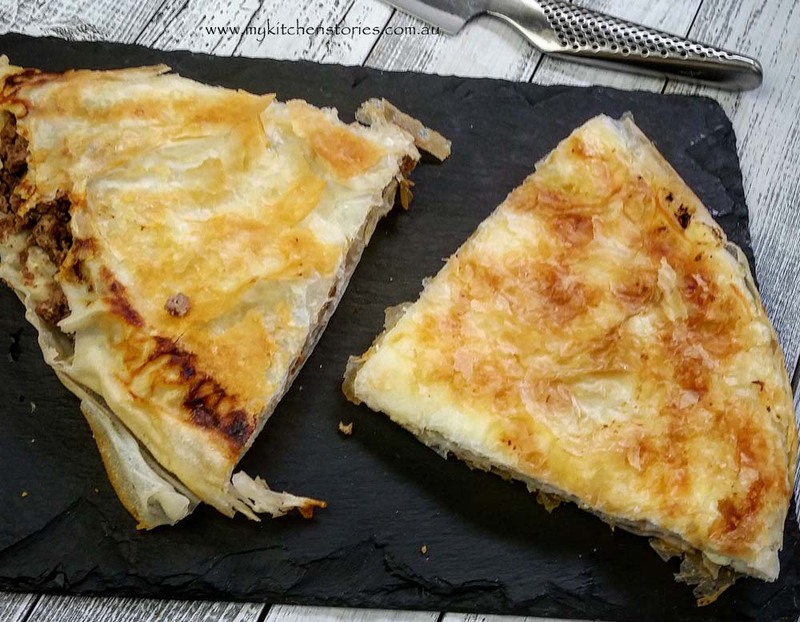 This cafe is full of locals all the time, catching up and devouring both sweet and savoury versions of these Burek with syrupy black coffee or chilled glasses of buttermilk. It reminds me of the campsite I lived in for 3 months in Zadar near Split in Croatia. The shop would open early in the morning and people would line up paste my tent. They would turn up an hour before the little canteen stall opened and chat outside my tent. Each Saturday, people would continue to line up until all of the Burek was gone. One Saturday morning I found myself on that line and after tasting my first hot crispy Burek, I was on that line every Saturday after. Here in Rockdale though, we line up and collect ours and head home. Very delicious. This is a fluffy light cake. Serve it with cream or vanilla yoghurt. It would be great made into a honey roll or served with sweet cinnamon apples and a drizzle of honey. Oven 160 C / 325 F. This recipe will make 2 x loaf tins (10 x 25 cm) or 2 x 20 cm round cakes. line the loaf tins with baking paper and grease or spray them. Separate the eggs and set the whites aside. Mix the flour, spices,salt and, bp and bs. Beat the yolks and brown sugar till thick and creamy. Add the oil in a stream and keep beating. Add the honey and whip till thick. Gradually add the coffee and the flour mixture alternately, till just mixed. Mix lightly once you start to ad the flour, over mixing can make this cake tough. Beat the whites till stiff and white and fold into the cake batter by hand. Pour the cakes into the prepared cake tins and then bake for approximately 50 minutes for a loaf tin. 20 cm round will take about the same time. About half that time will be needed for a flat slab tin. Ooooh, I love both borek and honey cake! I closed my eyes when I initially saw your honey cake and could swear I could smell it from here! Your borek looks delicious and thank you also for this month’s kitchen view! I love cake… and boreks. They both look delicious. This sounds delicious Tania I’m assuming that’s 4 eggs not 47, hehehehe. i’ve been very alarmed to hear about the ongoing loss of bees! i suppose i’ll be very careful with my honey usage from now on, and a cake like this is certainly a worthy place for it. My Macedonian husband would faint over those borek–and probably the honey cake as well. As might I! Coffee in honey cake…this is a new combo for me and I love how beautiful it turned out. I want one of those burek’s and finish off with some of this honey cake. Please. and thank you. It is scary to think that not only are bees declining, we aren’t entirely sure why (or how to help the situation). I hope cakes like this won’t become a distant memory! It sounds lovely. I’m going to wade right into the honey debate by saying I thought they were dying off because of GM crops. Oh I don’t know – whatever it’s all a sad indictment on us all! I can’t imagine a world without honey or bees. Borek is a favourite of mine too – whenever I see it at a Farmers Market I head straight to the stall. Your honey cake looks absolutely delicious I will be giving that a try. No Claire I know it looked like a fried egg but it was way too late at night to do it again! 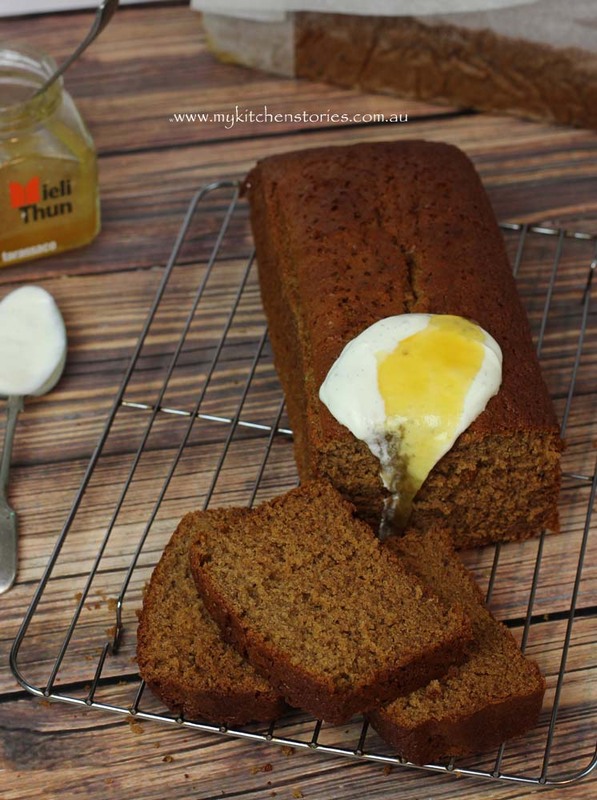 Oh, thanks so much for sharing the honey cake recipe. I have some honey which is just starting to crystallize so I need to use it up. My fussy family don’t like it with crunchy bits! Oh fussy families cause us to eat cake.! Yes the whole bee issue is really important. I am just about to buy some native Australian bees for my garden, which we really need… I have a wonderful Cheese Borek recipe from an Armenian friend, which I make sparingly because it is so tasty that every time I make it I tend to eat the lot. Yum! What a great recipe. This would be perfect for afternoon tea.. or even breaky! Yep, I would say brekky! Fantastic recipe thank you for sharing. I hope you check out my IMK too. Best wishes. Emma.